Ukraine Crisis: Russian Roulette in Space? 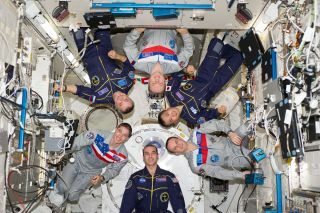 The Expedition 38 crew of the International Space Station poses for an in-flight crew portrait in the Kibo laboratory of the International Space Station on Feb. 22, 2014. Rocky Russian relations could leave U.S. astronauts without rides to the International Space Station. Since NASA retired its fleet of space shuttles in 2011, Russia has had a monopoly on flying crews to the orbital outpost. The only other country currently flying people in space is China, which is not a member of the 15-nation space station partnership. That leaves the United States in a vulnerable position as it ponders options to defuse a tense standoff between Russia and Ukraine. For now, the U.S.-Russian space partnership is insulated from the political whirlwind generated by Russia's decision to move troops into the Ukrainian peninsula of Crimea last week, fueling fears of a full-fledged invasion. "We are continuing to monitor the situation," NASA administrator Charles Bolden told reporters on a conference call on Tuesday. "Everything for us continues to be nominal," he said. Bolden noted that the space station has been through "multiple international crises" since crews began living there full-time on Nov. 2, 2000. That includes the 2008 war between Russia and Georgia over break-away regions Abkhazia and South Ossetia. NEWS: Can Revolutions Like Ukraine's Spread Across the World? "NASA and its Russian counterpart, Roscosmos, have maintained a professional, beneficial and collegial working relationship through the various ups and downs of the broader U.S.-Russia relationship and we expect that to continue throughout the life of the (space station) program and beyond," NASA added in a statement. The situation could have a silver lining. NASA has been investing in private companies that want to build and fly commercial passenger spaceships with the goal of breaking U.S. reliance on Russia for station crew transportation by 2017. "It certainly increases the impetus for the United States to lessen its dependence on the increasingly fickle and prickly (Pres. Vladimir) Putin's Russia," Joan Johnson-Freese, professor of national security affairs at the U.S. Naval War College in Rhode Island, wrote in an email to Discovery News. The Obama Administration's budget request for NASA for the year beginning Oct. 1 includes $848 million for the agency’s so-called “Commercial Crew” initiative. An additional $250 million for the program could come from a proposed supplemental budget, NASA’s chief financial officer Beth Robinson said. "It seems to me that the main message right now is that the U.S. has put itself in a situation of dependency on our relationship with Russia and that ought to be unacceptable,” John Logsdon, former director of the Space Policy Institute at The George Washington University, told Discovery News. "Hopefully, this will serve as a wake-up call — or another wake-up call — that the administration and Congress should even accelerate funding for Commercial Crew to get rid of the dependency as quickly as possible," he said. NASA is not the only agency potentially facing a game of Russian space roulette. A United Launch Alliance unmanned rocket, used almost exclusively to fly U.S. militarysatellites, has a Russian engine. "ULA protects our customers and ourselves from any supply disruption by maintaining a two- to three-year safety stock of engines in our factory," company spokeswoman Jessica Rye wrote in an email to Discovery News. "In addition, if there is any extended disruption … our U.S. supplier has demonstrated the capability to co-produce the engine or build a replacement engine in the United States," Rye wrote. Scott Pace, who succeeded Logsdon at the Space Policy Institute, said the United States has options to sanction Russia that would spare the countries' key space relationships. "Space is one of these things where there is mutual self-interest going on. I can think of other more-targeted economic sanctions rather than actions that are largely symbolic or would disproportionally hurt the U.S. side," Pace said.